I welcome you to the Ursuline High School website. I hope it will enable you to learn more about the Ursuline legacy and its grand traditions, which have been an integral part of Catholic education in the Mahoning Valley for over 100 years. 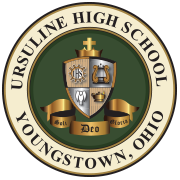 Established in 1905 by the Youngstown Ursuline Sisters, Ursuline High School has provided a community of faith and an academic environment within which young people are challenged and supported to become who they have been called to be by their Creator. Our religious heritage permeates every facet of life at Ursuline. We proclaim the Word through formal instructional programs, through experiential activities, and through the celebration of the Liturgy. We build community to reinforce Catholic values as the basis for decision-making and as the model for personal relationships. We foster respect for our differences in gender, creed, race, and nationality by celebrating our unique talents, gifts, and abilities and by developing relationships that energize us in our work together. We are committed to lives of service and our students have countless opportunities to reach out and befriend the poor, the elderly, and the dispossessed. 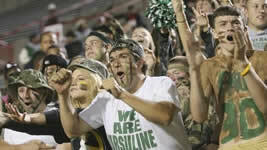 Ursuline High School has a tradition of academic excellence demonstrated by our students who are named National Merit Finalists and Commended Scholars, by the rigorous standards of our nine Advanced Placement programs, and by the high percentage of Ursuline students (98%) who continue their education at colleges and universities around the country. Recent classes represent Ursuline today at Notre Dame University, John Carroll University, the University of Pennsylvania, NEOMED, and Ohio State University to name only a few. Commitment to the Fine and Performing Arts has long been a hallmark of the school. A full curriculum of studio art instruction is enhanced by elective courses in ceramics and multimedia art. The music program features marching and concert bands that successfully compete on local, regional, and national levels. Our theater department stages four major productions each year: Student One Acts in the fall, a major musical in December, a comedy or drama production in February, and the Spring Musical in May. Our students have multiple opportunities to develop their unique gifts and talents through a wide range of extra-curricular activities. Through these programs our students hone their leadership skills, recognize the importance of hard work, channel their energy and enthusiasm, develop their creativity and imagination, and form relationships with adult mentors and their peers who share their values and interests. Ursuline High School is blessed with a dedicated and talented staff who live the Ursuline motto Soli Deo Gloria — For the Glory of God Alone — each and every day. Over two-thirds of our teachers have master’s degrees, and all continue their education through planned professional development programs annually. 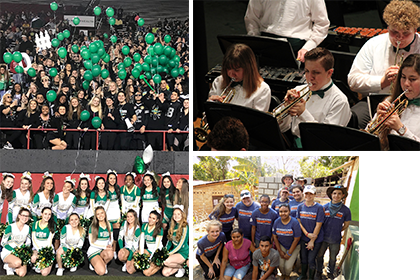 Their commitment to their students extends beyond the classroom by serving as mentors, advisors, and chaperones. I invite you to learn more about Ursuline by exploring the pages of this website, and I encourage you to visit our school in person. I would love to meet you when you visit – be it as a parent, prospective student, alumnus or friend of our school. Soli Deo Gloria…Go Irish. A member of the Ursuline Family since 2000, Mr. Matt Sammartino has held a variety of positions at UHS during his tenure. Matt began his career at Ursuline as a member of the Social Studies Department teaching Advanced Placement US Government and Politics, Advanced Placement American History, Economics, Psychology, and US Government. 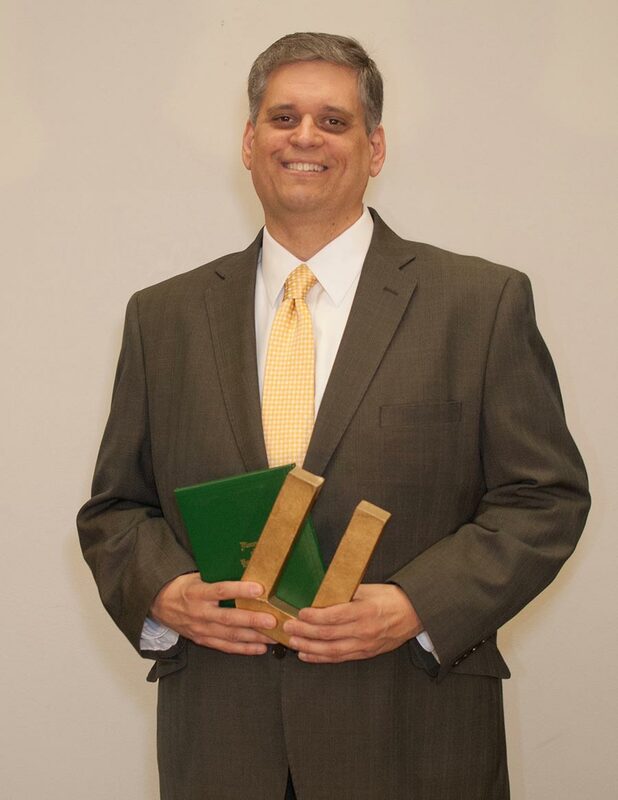 Mr. Sammartino became a member of the Ursuline Administration as the Assistant Principal for Student Affairs and was appointed Principal of Ursuline in July 2015. Mr. Sammartino has been highly active within the student community and has served as both Junior Class Advisor and Student Council Advisor. Mr. Sammartino instituted the Ursuline Student Ambassadors. Students continue to benefit from “Mr. Sam’s” passion for United States government and politics as he continues to teach AP US Government and Politics. He earned his undergraduate degree at Duquesne University in Education and his Master of Educational Administration from Youngstown State University. Mr. Sammartino is a member of Saint Charles Church. 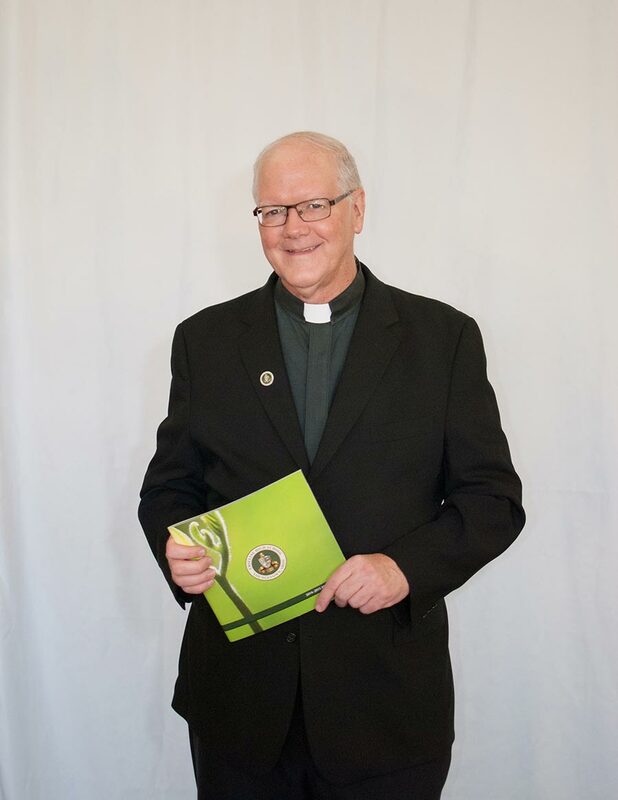 A 1972 graduate of Ursuline High School, Father Richard Murphy has served the Diocese of Youngstown’s secondary educational institutions for decades. Father Murphy began his teaching career in 1982 at Cardinal Mooney High School in the Religious Education Department. He was then appointed Associate Principal for Pastoral Ministry at Ursuline High School in 1986. Not only serving as a member of the Administration, Father Murphy taught in the Religious Education Department at Ursuline for 22 years, on both the junior and senior levels. In 2008, Father Murphy was appointed President of the Warren John F. Kennedy Schools and returned to his alma mater once again in 2010. In 2010, Father Murphy assumed the position of Executive Advancement Director and in 2011 was appointed, first ever, President of Ursuline High School. As President, Father Murphy acts as the administration’s liaison to the school Board of Directors and acts as the Bishop’s agent to guarantee authentic Catholic culture and identity. A native of Youngstown’s Northside, Father Murphy earned his undergraduate degree in political science and English from American University, a Master of Theology Degree from the Athenacum of Ohio, and a Master of Religious Education Degree from Boston College. Father Murphy also serves as the Pastor of Saint Mary’s Church in Mineral Ridge. 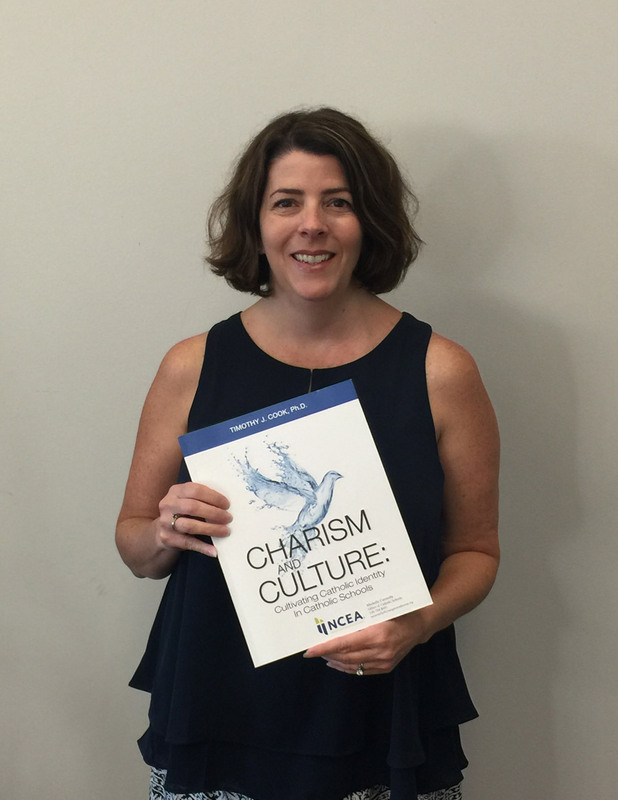 Mrs. Michelle Carosella began her tenure at Ursuline in July of 2017. Prior to her time at U.H.S., Mrs. Carosella worked at the Office of Catholic Schools for the Diocese of Youngstown. Mrs. Carosella is graduate of Magnificat High School in Rocky River, Ohio. She earned her Bachelor of Education Degree from The University of Toledo and Masters of Education at John Carroll University. She has worked in the Solon City Schools as an interventionist where she designed instruction for students with disabilities, as a teacher for students with limited English proficiency, as a third grade teacher as well as a media specialist. Mrs. Carosella and her family belong to Holy Family Church. 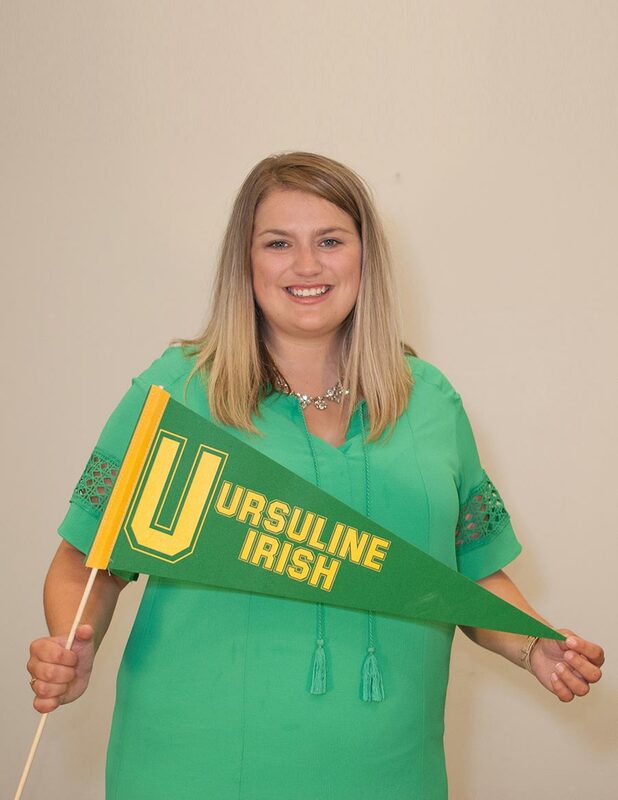 A 2006 graduate of Ursuline High School, Miss Maggie Matune has served as the Assistant Principal for Student Affairs since July 2015. Miss Matune joined the Ursuline Faculty in 2010 as a member of the Social Studies Department. During her time in the classroom, she taught American History, American Government, American Law, Advanced Placement Psychology, and Advanced Placement US History. In addition to teaching, from 2013-2015, Miss Matune coordinated the school’s technology program. Miss Matune has been involved with many student activities, including Students of Stewardship and its mission trips to El Salvador and Nicaragua and The Student Ambassadors. In the past she has served as Sophomore Class, Senior Class, Model United Nations and Irish Times Advisor. She continues to teach AP Psychology. Miss Matune earned Bachelor’s Degrees in history and education at John Carroll University, a Master’s Degree in Nonprofit Administration from John Carroll University, and a Master’s of School Administration from Youngstown State University. Miss Matune is a member of Saint Christine Church. We are Ursuline, a college preparatory high school of the Roman Catholic Diocese of Youngstown. We come from diverse backgrounds in the spirit of St. Angela Merici and the Ursuline Sisters to be living witnesses to the wisdom and virtue of Christ and His Church. We form a family of faith, achievement, and promise, striving to be life-long learners and responsible citizens in a global society. We promote excellence in all aspects of the Ursuline experience. We assist our students in the proper formation of a moral conscience in order that they might live their lives more abundantly in Christ and serve one another. We strengthen the necessary partnership between home and school, affirming that Ursuline exists to serve the primary educator of the student – the parent or guardian. We are committed to educating students of diverse economic, cultural, religious, racial and ethnic backgrounds. We promote responsible social change based on Gospel values. We champion superior standards of academic achievement which establish the groundwork for our graduates’ success in personal, academic and career endeavors. We integrate Gospel values and Catholic teachings within the curriculum. We nurture each person’s inherent worth and dignity. We express the foundational sacramental principle that God acts through everyone; that all can make a difference, all can touch the future, and all can build the Kingdom of God. We employ traditional and innovative methods of inquiry, research and assessment, which meet the many educational needs of the learners in our care. We continually challenge one another – adults and adolescents – to strive for growth as learners, believers, and citizens. We resolve issues of conflict and division by mutual respect and a Christian regard for one another that affirms the goodness of the individual and the strengthening of our community. With your colors green and gold. We your loyal sons and daughters. Pledge to you our faith untold. In our hearts and in our mem’ries. Lingers deepest love for you. Down to the other goal. 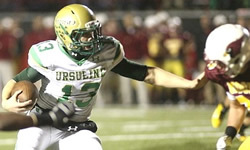 Ever since Ursuline became involved in inter-scholastic sports, it has been known as “The Fighting Irish.” Perhaps it was a natural outgrowth of the association of “Irish” with “Catholic,” even though the Ursuline Order was founded by an Italian nun and established in this country by the French. However, in the late 1930’s our nickname came very close to being changed. Here’s the story. There were some voices of dissent by some of the non-Irish families who resented being referred to as Irish. Therefore, an honest attempt was made to change the name. An ad hoc committee was formed to consider ethnically-neutral names. A compromise was settled upon. An interim nickname would be used: the Irish Terriers. Father Conry, the principal, gave his approval. The next stop was to inform the Press (the word “Media” had not yet been invented). A meeting was set up with Frank Ward, sports editor of The Vindicator. When told of the proposed change, Mr. Ward said, “Gentlemen, you can use any nickname you want, but as long as I’m the sports editor of The Vindicator, Ursuline will be known as the Fighting Irish.” And, that was the end of the “Irish Terriers.” The Fighting Irish had survived. 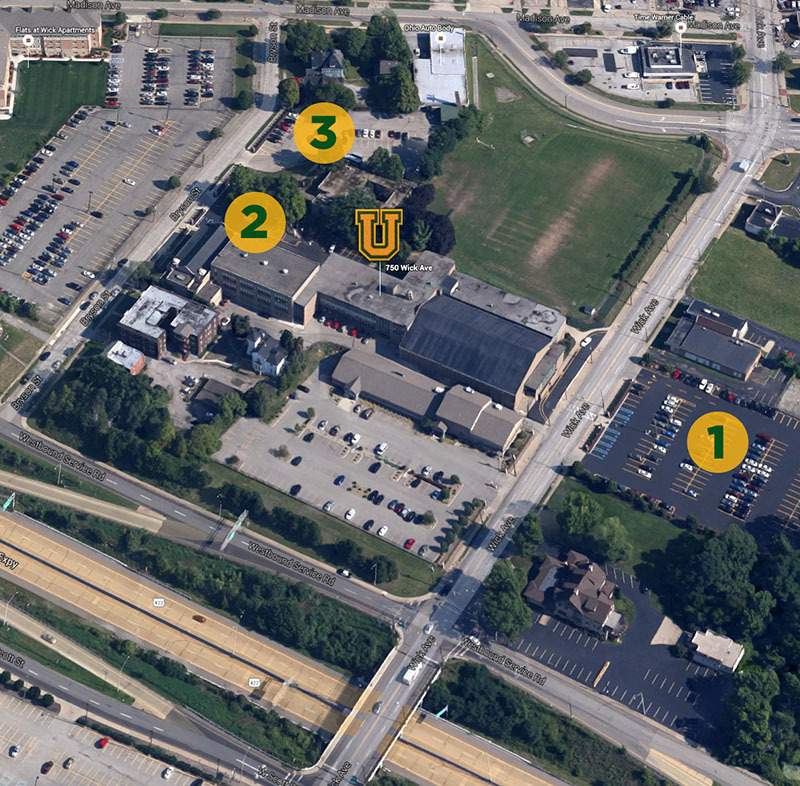 Ursuline High School is conveniently located in the city’s cultural and educational center. Located adjacent to the YSU campus on Wick Avenue with immediate access to I-680, Ursuline is close to any Mahoning Valley community. Easy access from Interstate 680 makes driving a popular option for many Ursuline families. Many arrange carpools with other students from their neighborhood. The State of Ohio reimburses parents who drive their students when bussing is not available through a student’s local school district. Campbell, Girard, Hubbard, Liberty, and Youngstown.